It may be harder for younger basketball fans to fathom, but there was a time when it was more difficult to find out information about our favourite sport. Although the NBA was extremely popular by the mid-to-late 90s, with live broadcasts, plenty of coverage and merchandise, and of course, video games, it wasn’t always easy to get your hands on in-depth information. The World Wide Web was still in its infancy, so we didn’t have wonderful resources such as Basketball Reference. A lot of our info came from almanacs, the official NBA Encyclopedia, magazines, and even trading cards. Video games also proved to be a source of interesting facts. NBA Live had already dabbled with providing a few NBA facts and figures as a form of bonus content. 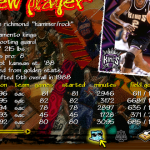 In NBA Live 96, the team roster screens included a button to view an overview of the franchise’s history. A trivia question was also shown at halftime, with the answer being revealed between the third and fourth quarters. 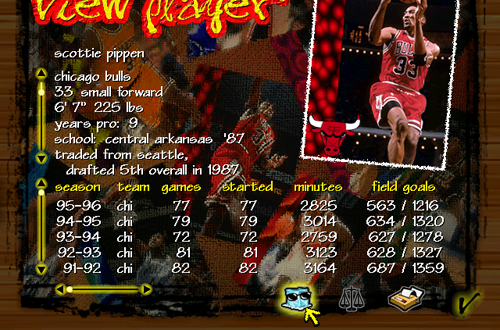 NBA Live 97 took the idea a step further with Cool Facts. When viewing a player’s profile, hitting Cool Facts played an audio clip that provided an interesting trivia note about them. Some players had more than one Cool Fact, so hitting the button again would play the next audio clip, until the game looped back to the first one. In many respects, it was a gimmick that took advantage of the medium. Much like the video clips in NBA Jam Tournament Edition, it was a creative use of the extra space afforded through the use of CD-ROMs for the PC and PlayStation versions. The facts themselves did tend to be interesting though, and when it came to the Class of 1996 rookies or some of the veteran journeyman, it was possible to learn something that you didn’t already know. Some Cool Facts were admittedly common knowledge, or even contained information presented on the profile itself, but if you happened to be a relatively new NBA fan, they could be quite interesting and informative. Although an impressive number of players have at least one audio clip, there are a handful of players who have no Cool Facts. Some of the players who don’t have a single Cool Fact are actually quite surprising. For example, Stacey King has no Cool Facts despite being a member of three Chicago Bulls championship teams in the early 90s, while second year reserve Terrence Rencher has two clips. Generally speaking, however, it’s mostly benchwarmers and late second round rookies that are missing Cool Facts. Not surprisingly, the Roster Players representing Michael Jordan and Charles Barkley also lack them, though that would’ve been interesting to hear. As noted in my retrospective of NBA Live 97, its presentation is very mid-to-late 90s, with graffiti-style backgrounds and font, and all lowercase letters. The PC version also used several creative and colourful icons in the place of the standard buttons that were seen in NBA Live 95 and NBA Live 96. The button for Cool Facts was an ice cube wearing a pair of sunglasses; it doesn’t get much cooler than that! If a player had no Cool Fact, the button went dark and couldn’t be clicked. On PlayStation, there was simply a text button, and a dialogue box was displayed if there was no Cool Fact to play. Its View Player screen also used the same music as the Pause screen on PC. I’m sure that a lot of old school NBA Live gamers can attest to spending some time going through all the player profiles and listening to the Cool Facts. Again, a lot of keen NBA fans probably knew several of the facts already, but it was fun to explore that content all the same. It was interesting to see which players did and didn’t have any Cool Facts, how many they had if they did, and what trivia had been chosen. In some cases, you might indeed learn something new, particularly when it came to the players who generally didn’t get a lot of coverage in magazines or the weekly recap shows. 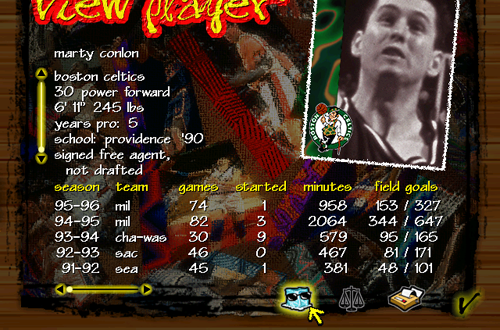 If you wanted to know more about Marty Conlon, well, he had two facts! 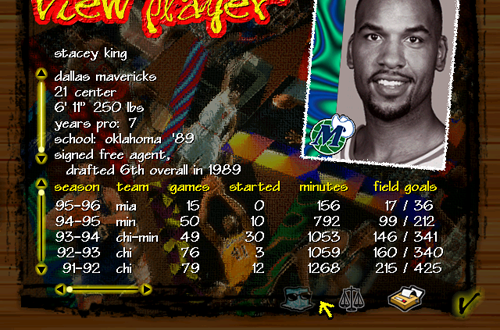 Cool Facts were fun in NBA Live 97, but there’s admittedly very little need for them in modern NBA video games. With the amount of resources, references, and overall coverage that we can find online these days, there’s less appeal in the idea of a handful of audio clips offering up trivia for every player in the league. We can easily find that information ourselves, and the disk space is better used for higher resolution artwork, presentation elements such as player interviews, and other details that enhance the experience. Even the name “Cool Facts” probably sounds a little corny now, to say nothing of an ice cube sporting sunglasses. The concept is unquestionably dated. Like many other outmoded features, however, Cool Facts was a fun idea in its day, and it’s something that we can look back on fondly. It’s not a feature that necessarily needs to make a return, but it served its purpose back in NBA Live 97, feeding our fanaticism for the NBA and giving us extra content to dig through in between playing games. It was a gimmick that may not seem very impressive long past a time when CD-ROMs were beginning to take over as the standard format in gaming, but back then, it was another way of setting the PC and PlayStation versions apart from the cartridge-based Super Nintendo version. In 1996, Cool Facts was indeed cool. In gamestop they got nba 2k18 for pc download for 10 dollar. What is the review for nba 2k18 for pc? Does it have the expansion draft mode? Rather off topic here, but yes. The PC version of NBA 2K18 is the same as PS4 and X1 version. If you have any further questions, feel free to post them in the NBA 2K18 section of the Forum. Great article about mba live 97 one of my favorite game! When NBA Live was the kING of basketball game ! Indeed. Games have come a long way since, but lots of good memories from that era. Inter core i7-7500 cpu @ 2.70ghz 2.90 ghz. AMD hardware Radeon TM R7 Discrete/ Hibrid. Can I Play nba 2k18 in this pc? Again, really a question for the NBA 2K18 section of the Forum, but you should be fine. Might not be able to max out on a laptop video card, but it should run. Thanks ! I’m trying to sign in but it say no email register. Email andrew@nba-live.com and let me know your username, and I’ll look into it.